Thanks to Nick Rutkowski who submitted this idea. The premise of Treasure Hunt is very simple. 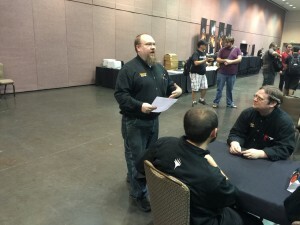 The Huntmaster (for example the team leader) creates a list things that judges are to look out for during the tournament on the floor. The list should contain about 10-15 items, which should keep everyone busy during the day. The first judge to finish their list or the one with the most crossed off at the end of day briefing is the winner! The Treasure Hunt keeps judges motivated, active, engaged and looking for things they might not have noticed otherwise. And changing your perspective often opens you up to new discoveries. At the end of the day, also share any stories that are tied to your discoveries for a great end of the day. A player loses by or with having 0 cards in Library. Answer a judge call involving Golgari Charm / Nature’s claim vs Rest in Peace. 3 Force of Will’s cast in a single turn. A player attacks with 4 Tarmogoyfs in one turn. A player survives (not scoops to) an attack by an Emrakul. A player activates Jace, Vryn’s Prodigy twice in the same turn. A player has permanents of all 5 colors in play before turn 5. Answer a judge call for oracle text of a card. Push in 10 chairs. Not all at the same time nor the same chair 10 times. A player wins with 0 cards in their library. Bonus tie-breaker: What is the most expensive/unique/interesting card/deck you saw in play. Use the HJ as the judge for the question.